Pickle and I went on an adventure at the weekend, taking the train up to stay with my parents for a couple of days. 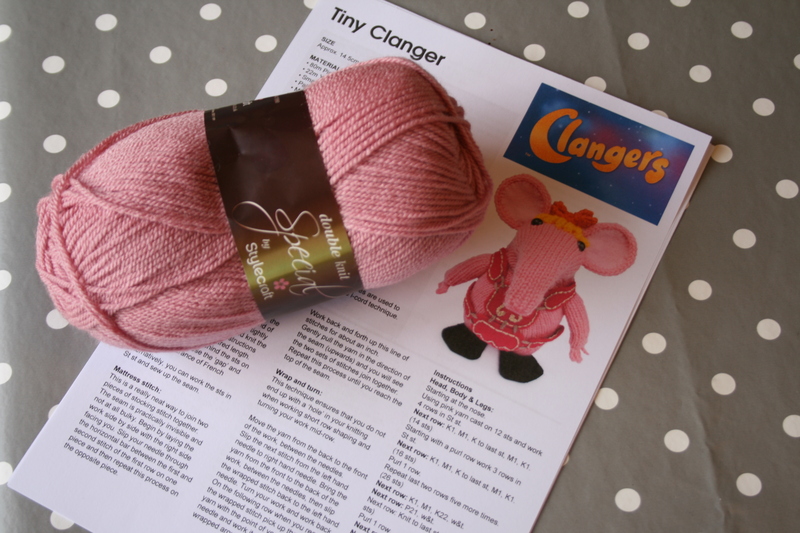 Whilst we were there, I wandered up to the local yarn shop, in search of ‘Clanger Pink’. The shop assistant was most helpful, and even produced a full book of patterns which I used for colour matching. The best match was a ball of Stylecraft in Pale Rose so, mindful of having to lug a suitcase and a two year old home on the train, I purchased that and nothing else. How very restrained! I have the pattern already from the CBeebies website and printed it off yesterday, so that I have no more reason to procrastinate over starting it. Aside from, you know, life stuff, which feels a bit crazy at the moment. I realised I was rather chilly this evening whilst putting Pumpkin to bed. I found myself mentally skimming through my wardrobe for an appropriate jumper or cardigan I could throw on for the evening, and you know which one sprang to mind? Yes, my newly finished cardigan of doom snuggliness! 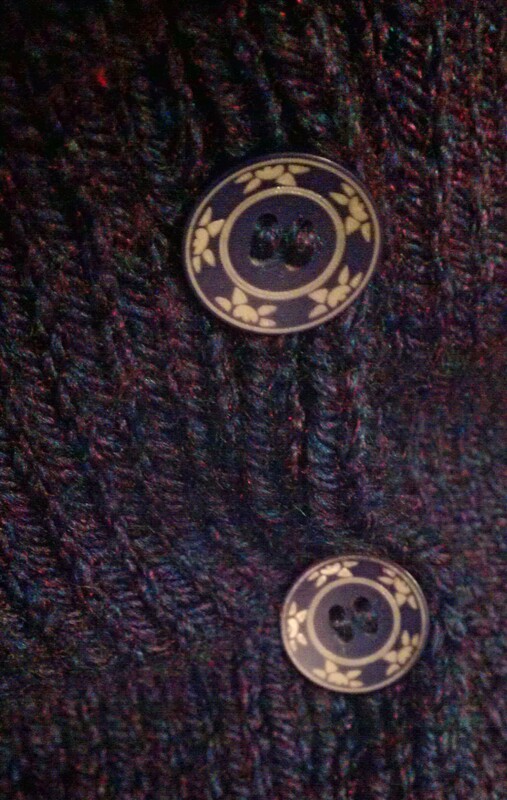 It’s been finished for a week now, and I still haven’t managed to get any decent photos, so here’s a quick shot I took on my phone, and a close up of the buttons I used. As you can see, it’s a little short in the body, which is a little frustrating, given that I thought I had added some extra length into it, but it’s certainly not a fatal flaw. The sleeves are lovely and long, so I can tuck my hands into them to keep warm. The collar is a little gapey at the back of the neck, but again, not fatal. The fit around the waist could also have been a little closer, but it has a bit of shape to it, and a bit of ease means it’ll fit over layers of clothing in the winter without being too bulky. All in all, it’s really not bad for my first ever knitted garment! 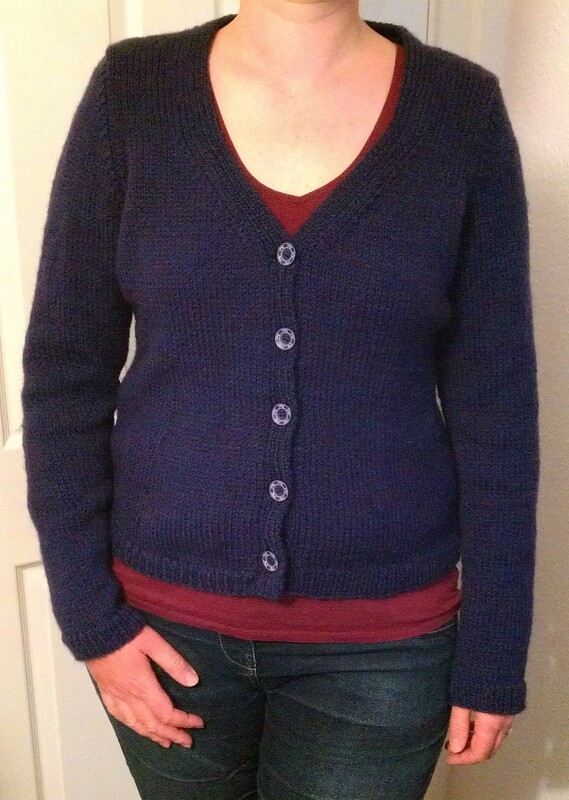 The cardigan of never-ending doom is really, truly, actually, completely, wearably finished! Buttons and everything. It won’t win any prizes, and I may not even wear it out of the house! But it is finished. Hurrah! Excuse me while I happy-dance around the room. Maybe now I can allow myself to work on some other things again and more regular blogging may resume.